Replantation of completely amputated digits has been a medical reality since 1968, when Komatsu and Tamai first reported successful replantation of a completely amputated thumb. Amputation of digits is common. Approximately 100,000 digital amputations occur per year in the United States. Of those, an estimated 30% are suitable for replantation. The exact number of replantations performed yearly is unknown. However, the number appears to be decreasing, secondary to more rigid selection criteria, improved workplace safety procedures, and better-designed protection devices on power tools. An image depicting digital amputation can be seen below. Complete amputation of two digits. Carrel performed experimental replantation of a canine hind limb in 1906. Malt successfully replanted a completely amputated arm in 1964,  and Meredith performed replantation after a distal radius/wrist injury in 1965. Chinese surgeons at the Sixth People's Hospital performed successful replantations in the 1960s. However, the first digital replantation occurred in 1968, with Komatsu and Tamai's report of a successful thumb reattachment. A complete amputation occurs when the injured part is no longer attached to the patient. If any portion of the digit remains attached, a partial or near amputation has occurred, and the repair process is a revascularization, not a replantation. Although it is technically feasible to revascularize damaged digits, restoration of function and appearance is crucial and a patient-centric approach optimal. 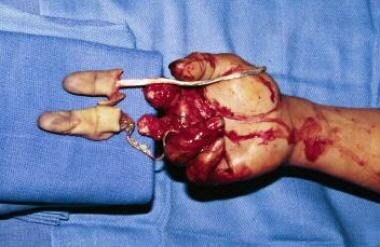 Amputations of digits occur secondary to laceration, crush, avulsion, and combination injuries. They may occur at any location but frequently occur at work or at home. Amputations have been reported in children secondary to injuries from exercise equipment, car doors, and home doors. In adults, injuries occur from saws, knives, hydraulic wood splitters, and a variety of industrial machines. Home injuries frequently involve table or circular saws. Work injuries are multifactorial, and demographics are changing constantly because safety equipment is added and equipment is adapted following mishaps to prevent similar occurrences. Following amputation, cell death is irreversible if ischemia produces critical cell lysis. Prior to irreversible cell death, reperfusion is possible. Time from injury to reperfusion and salvage depends upon the type of tissue involved and the temperature of the injured part. Muscle at room temperature is irreversibly damaged in 6-8 hours; if cooled, it can withstand a maximum of 8-12 hours of ischemia. However, if digits are cooled without freezing, they may survive longer than 100 hours. The clinical presentation of a completely amputated digit is obvious. The important considerations are the level of the injury, the mechanism of the trauma, and the general health of the patient. In general, diagnostic testing is not indicated, with the exception of plain radiographs to evaluate bony integrity. Routine preoperative evaluation of the patient is critical. It may not be possible to determine replantation potential without exploration in the operating room. Indications for surgical replantation have evolved over the last 20 years. The major indications for replantation in the absence of prolonged ischemia, segmental damage, and diffuse crush or severe avulsion injuries are amputations of the thumb, multiple digits, a digit in a child, and a digit distal to the flexor digitorum superficialis insertion. The important anatomic consideration is the size of the injured vessel. In children older than 2 years, vessels proximal to the middle portion of the middle phalanx are more than 0.4 mm. In adults, digital arteries are more than 0.4 mm proximal to the lunula of the nail. The radial digital arteries to the thumb and the index finger, and the ulnar digital artery to the little finger are, in general, significantly smaller than the parallel vessels. Relative contraindications to surgery are complete amputation of a digit proximal to the flexor digitorum superficialis insertion, severe crush or avulsion injuries, segmented injuries, and/or severe bony comminution with loss of bone and joint integrity. Major contraindications to surgery are prolonged warm ischemia, crush or avulsion injuries with diffuse arterial damage, and/or inability to obtain reconstruction that would allow a functional digit. Komatsu S, Tamai S. Successful replantation of a completely cut-off thumb: case report. Plast Reconstr Surg. 1968. 42:374-7. Carrel A, Guthrie CC. Results of a replantation of a thigh. Science. 1906. 23:393. Malt RA, McKhann C. Replantation of several arms. JAMA. 1964 Sep 7. 189:716-22. [Medline]. Meredith JH, Koman LA. Replantation of completely amputated distal forearm--1965. J South Orthop Assoc. 1999 Fall. 8(3):214-7. [Medline]. Beris AE, Lykissas MG, Korompilias AV, Mitsionis GI, Vekris MD, Kostas-Agnantis IP. Digit and hand replantation. Arch Orthop Trauma Surg. 2009 Dec 9. [Medline]. Reavey PL, Stranix JT, Muresan H, Soares M, Thanik V. Disappearing Digits: Analysis of National Trends in Amputation and Replantation in the United States. Plast Reconstr Surg. 2018 Jun. 141 (6):857e-867e. [Medline]. Dec W. A meta-analysis of success rates for digit replantation. Tech Hand Up Extrem Surg. 2006 Sep. 10(3):124-9. [Medline]. Lin CH, Aydyn N, Lin YT, Hsu CT, Lin CH, Yeh JT. Hand and finger replantation after protracted ischemia (more than 24 hours). Ann Plast Surg. 2010 Mar. 64(3):286-90. [Medline]. Zhu H, Bao B, Zheng X. A Comparison of Functional Outcomes and Therapeutic Costs: Single-Digit Replantation versus Revision Amputation. Plast Reconstr Surg. 2018 Feb. 141 (2):244e-249e. [Medline]. Morrison WA, McCombe D. Digital replantation. Hand Clin. 2007 Feb. 23(1):1-12. [Medline]. Wagner ER, Bishop AT, Shin AY. Venous Bridge Arterial Grafting for Thumb Replantation. Hand (N Y). 2017 May. 12 (3):272-276. [Medline]. Hasuo T, Nishi G, Tsuchiya D, Otsuka T. Fingertip replantations: importance of venous anastomosis and the clinical results. Hand Surg. 2009. 14(1):1-6. [Medline]. Wen G, Xu J, Chai YM. Fingertip Replantation With Palmar Venous Anastomoses in Children. Ann Plast Surg. 2017 Jun. 78 (6):692-696. [Medline]. Nunley JA, Goldner RD, Urbaniak JR. Skeletal fixation in digital replantation. Use of the "H" plate. Clin Orthop. 1987 Jan. (214):66-71. [Medline]. Stirrat CR, Seaber AV, Urbaniak JR. Temperature monitoring in digital replantation. J Hand Surg [Am]. 1978 Jul. 3(4):342-7. [Medline]. Fulcher SM, Koman LA, Smith BP. The effect of transdermal nicotine on digital perfusion in reformed habitual smokers. J Hand Surg [Am]. 1998 Sep. 23(5):792-9. [Medline]. Dabernig J, Hart AM, Schwabegger AH, Dabernig W, Harpf C. Evaluation outcome of replanted digits using the DASH score: review of 38 patients. Int J Surg. 2006. 4(1):30-6. [Medline]. Walaszek I, Zyluk A. Long term follow-up after finger replantation. J Hand Surg Eur Vol. 2008 Feb. 33(1):59-64. [Medline]. Goldner RD, Howson MP, Nunley JA. One hundred eleven thumb amputations: replantation vs revision. Microsurgery. 1990. 11(3):243-50. [Medline]. Weiland AJ, Villarreal-Rios A, Kleinert HE. Replantation of digits and hands: analysis of surgical techniques and functional results in 71 patients with 86 replantations. J Hand Surg [Am]. 1977 Jan. 2(1):1-12. [Medline]. Urbaniak JR, Roth JH, Nunley JA. The results of replantation after amputation of a single finger. J Bone Joint Surg Am. 1985 Apr. 67(4):611-9. [Medline]. Cong H, Sui H, Wang C, Wang Z, Yang Q, Wang B. Ten-digit replantation with seven years follow-up: A case report. Microsurgery. 2010 Jan 18. [Medline]. Thoma A, Jansen L, Sprague S. Outcomes in microsurgery. Plast Reconstr Surg. 2009 Dec. 124(6 Suppl):e303-12. [Medline]. Fufa D, Calfee R, Wall L, Zeng W, Goldfarb C. Digit replantation: experience of two U.S. academic level-I trauma centers. J Bone Joint Surg Am. 2013 Dec 4. 95(23):2127-34. [Medline]. Gelberman RH, Urbaniak JR, Bright DS. Digital sensibility following replantation. J Hand Surg [Am]. 1978 Jul. 3(4):313-9. [Medline]. Koman LA, Nunley JA. Thermoregulatory control after upper extremity replantation. J Hand Surg [Am]. 1986 Jul. 11(4):548-52. [Medline]. Brooks D, Buntic RF, Kind GM, Schott K, Buncke GM, Buncke HJ. Ring avulsion: injury pattern, treatment, and outcome. Clin Plast Surg. 2007 Apr. 34(2):187-95, viii. [Medline]. Urbaniak JR, Evans JP, Bright DS. Microvascular management of ring avulsion injuries. J Hand Surg [Am]. 1981 Jan. 6(1):25-30. [Medline]. Davis Sears E, Chung KC. Replantation of finger avulsion injuries: a systematic review of survival and functional outcomes. J Hand Surg Am. 2011 Apr. 36(4):686-94. [Medline]. [Full Text]. Kay S, Werntz J, Wolff TW. Ring avulsion injuries: classification and prognosis. J Hand Surg [Am]. 1989 Mar. 14(2 Pt 1):204-13. [Medline].